John Bell Pipeline Equipment Co. Ltd offer a complete range of Industrial Valves for use within all industries such as Offshore, Marine, Manufacturing, Services and Utilities. Our complete stock range covers Gate, Globe & Check, Ball, Rubber Lined Butterfly, High Performance Butterfly and Knife Gate Valves. We can supply all other valve types on request. John Bell Pipeline Equipment Co. Ltd utilises various actuator types & manufacturers when building valve and actuator packages. Simple On/Off pneumatically operated Butterfly Valves up to large ESDV’s can be supplied exactly to customer specification. 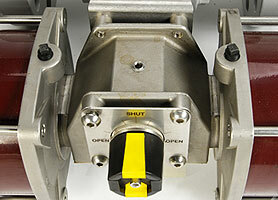 John Bell Pipeline Co. Ltd has the ability to supply all types of actuators for all valve types. Actuators can be supplied with all your control accessories as required such as solenoids, limit and proximity switches, overides and bespoke instrumentation panels. Our experience covers all actuator types, hydraulic, pneumatic and electric for all quarter turn and linear operations. All sales engineers will offer best solutions and options regarding all your actuation requirements.